I know, I know, it’s been kinda quiet for a while. It’s been busy here. But things are slowing down and now I’m catching back up with the blog! First, the life update: I GRADUATED!! No longer a student, I have finished my M.Div. from Yale! Second, a blog update: Here is a sermon I preached a few weeks ago at the Episcopal Church at Yale. The lectionary texts for the day were from the Gospel of John chapter 20 (the story of “Doubting Thomas”) and from Acts 5 (about the persecution of the Apostles). I didn’t post it right away, but given that the main metaphor of the sermon (the BBC Television series Doctor Who? ) has wrapped up its latest season, it seemed appropriate to finally put this up on the blog. Let me know what you think! I am a little bit addicted to Doctor Who? Yes, I recognize that sometimes the show can be hokey or campy. Sometimes the writing is sub-par. Sometimes the characters are less than compelling. First, of course, are the narrative threads running through every episode, linking things together in such a way as to always leave some tantalizingly unanswered questions about what’s next. Third, the show frequently pushes my “suspension of disbelief.” The entire premise is based on some intense sci-fi talk about time travel, fluid and often mixed up streams of history, and a hero with two hearts. When you add to that recurring alien races that alternatively are laughable– like talking potatoes– or the stuff of nightmares– like microscopic flesh-eating bugs that live in shadows, getting invested in the story frequently requires me to accept, at least for a moment, the reality of something I would normally consider impossible. Why does that keep me watching the show, you might ask? Well… I’ll explain that in a minute. First though, I want to note that the Christian faith could be said to also exemplify these three traits. The story of our faith is long and winding, but there are always interconnected themes pulling the pieces together. Our faith challenges us to ask important questions about who we are, how we live, and what it means to be part of a community. And our faith pushes us to suspend our disbelief. The encounter between the apostles and the religious authorities in our reading from Acts is a perfect example of this. Peter challenges these authorities by invoking what he claims is a higher authority: the commands of a crucified man whom is supposedly now the living savior of the people. The mini-lecture that Gamaliel gives the council provides us a good window into how the religious authorities viewed this story. The notion of a “savior” to them had particular political connotations having to do with the overthrow of foreign rule (namely, Rome). Gamaliel reminds the council of several previous claims to be “savior” and how those claims ended disastrously. Given that this latest supposed savior, Jesus, had already been put to death by the Romans, he warns them to steer clear lest another disaster fall of them. In other words, for Gamaliel and the council this story is just too unbelievable. What’s interesting to me is the method they undertake to reach this conclusion: The temple authorities put the claims of Jesus’ disciples under scrutiny, looking for reasons they might call their veracity into question. Have previous claims to be the “savior” turned out to be true? No. In fact previous claimants have all failed and been put to death. Does anything make this claim look different? No. In fact (as far as they know), this claimant has already been put to death. And so, not having seen the resurrection themselves, they conclude that without further substantiation there is simply no reason to believe these claims about Jesus are true. 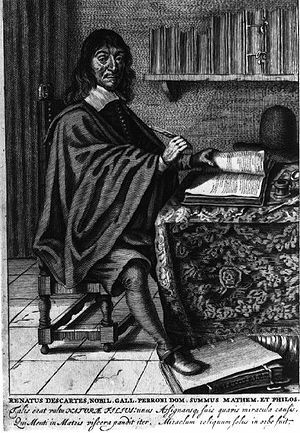 The method of the religious leaders closely mirrors that of one of the most famous philosophers of the modern age: Rene Descartes. Descartes’ method was to call everything into question until he had found things he could know with absolute certainty. Then, building out from this sure foundation, he would substantiate other claims and decide what else he could believe to be true. Now, it turns out his systematic doubting didn’t leave him sure of very much: his one foundation was, “I exist.” But setting aside the content of his system let’s note that Descartes used “doubt” to eliminate those beliefs that he found simply unbelievable, just as the temple authorities did with the disciples’ story about Jesus. Another major philosopher of the modern era will give us a slightly different take on “doubt.” Soren Kierkegaard suggests that “doubt” shows us only the limitations of our finitude, not the limits of what we should believe. That finitude is overcome, Kierkegaard claims, by the calling of God in our lives, a calling which comes from beyond our finite limitations and which calls us to believe the unbelievable and the impossible. The impossible is exactly what Thomas was having a hard time with in our gospel reading. Thomas doubts. And seemingly, Jesus rebukes him for it. We struggle a lot with this story today because it seems like Thomas gets a bad deal. The other disciples had seen Jesus, after all. And they all had their doubts, and so do we, so why is it that Thomas is the doubter? Well I don’t think it is so much that Thomas doubts but the way that he doubts that the author of the gospel wants to highlight. 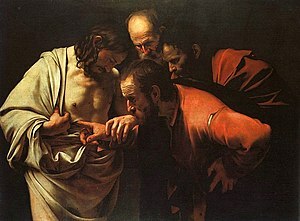 When Thomas demands to see Jesus, he is demanding to see proof for a claim he could not otherwise bring himself to believe. Thomas can’t suspend his disbelief, in the same way that the religious leaders couldn’t, unless evidence is presented to substantiate what the other disciples are telling him. He wants to see the nail marks, the place where the spear pieced Jesus’ side, the direct, physical evidence that this man was in fact his crucified teacher and friend come back from the grave. Jesus doesn’t leave Thomas in suspense, he gives Thomas this evidence. But he pronounces as more praiseworthy those who will “believe without seeing,” suspending their disbelief even without the evidence. And the gospel writer then concludes that his readers and hearers are those who are tasked with just this suspension of disbelief, those called to believe these stories about Jesus even though the direct, physical evidence cannot be put before them. How are we supposed to believe without seeing? How are we supposed to have the faith that Thomas could not muster? I think John would say that Thomas should have found faith in remembering the calling of God in his life. The other night in our Bible Study at ECY we talked about the phrase that Jesus uses to call his disciples in John’s gospel: “come and see.” Then we talked about the beautiful way that this phrase is re-appropriated in the story of Lazarus being raised from the dead, when Mary says to Jesus “come and see” the tomb where Lazarus lay, demonstrating the way that Jesus has shared in our lives and experiences. Thomas heard this call, and he came, and he saw Jesus at work. But now he has seemingly forgotten the power of this call and demands to see more. John would say, I think, that we also experience this call. In John’s prologue he says that the word incarnate, Jesus, came to the world, came to us, and that those who have received him and believed him have been given the power to become “children of God.” God is calling to us, calling us to suspend our disbelief and believe the impossible. But why would we find a faith that calls us to believe the impossible compelling? Well now I’ll finally tell you why I find the demand that I suspend my disbelief while watching Doctor Who? to be so intriguing. It’s because when we are asked to believe the impossible, it opens us up to an entire new horizon. It pushes our curiosity and challenges us to look at the world anew. It reveals to us new ways of being human, new ways of loving our neighbors, new ways of living in community with one another. And that is compelling, no matter our doubts.